Obsession of the Day: Vera Wang Web Butterfly Necklace | Fashion. Style. Beauty. | Life is short. Live well. I was recently fiddling around on the website of my beloved Bergdorf Goodman when I spotted this little slice of magic. You know that feeling when you fall in love, where your mouth is suddenly dry, your heart stops and you feel like you can’t breathe? Oh yes, upon viewing this amazing piece of artwork, I’m ready to believe in love at first sight again – all the requisite signs are there. Could you die over the mysterious beaded web chain detail? Do you swoon over the crystal butterfly near the fabric neckline closure? I do. This is me, lying dead on the floor over this piece. If you’re thinking what to wear this piece of art, my reply is to keep it simple: layer over a silk tank (or a cotton tank, whatever) or a simple solid-colored V-neck (or strapless – YES, strapless) dress. 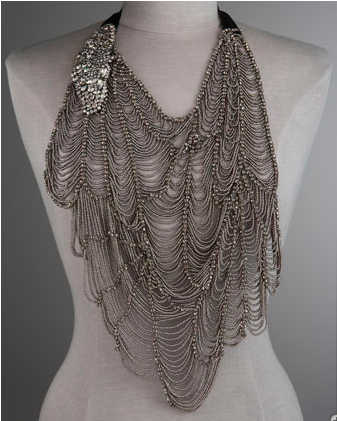 The necklace is the centerpiece of the look. No earrings, maybe a simple ring if you’re so inclined. Because this one is a showstopper. If you’re feeling very Patricia Field, add sunglasses on a stick as an accessory. Most of us have what we call a Fashion Bucket List, a whole mess of things that we want to experience, consume or own before we die. Vera Wang necklace, you’ve just made the Top Five.